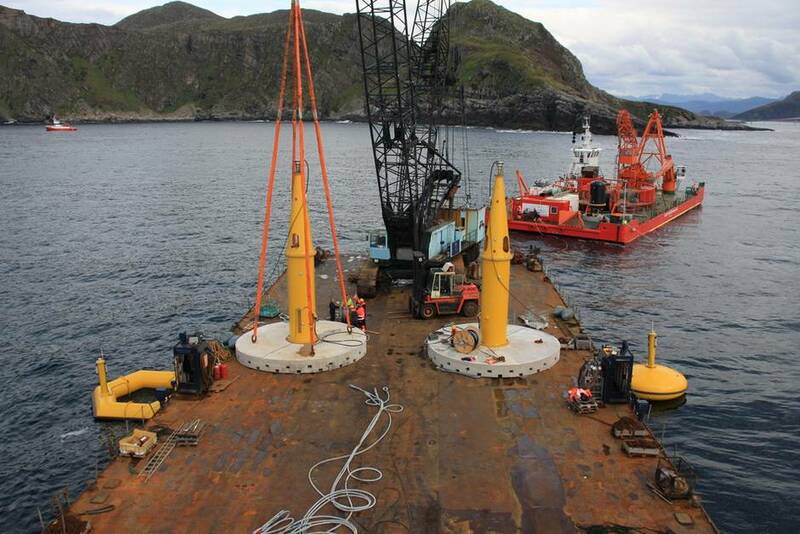 The installation consisted of two full scale Seabased devices, an under-water switchgear and a sub-sea cable (2.7 km) connecting the generators to the 22-kV grid. The wave power system was in operation only for a short time, and the equipment, except for the cable, was recovered in 2013. The technology consisted of linear generators, mounted to the sea floor, with surface buoys connected to the generator via a tight cable. The Runde test site is situated approximately 400 m off the island of Runde (West-Norway) at 45-90 m water depth on gravel substratum with interspersed rock and some sand. 25 km SW of Aalesund; County of Møre og Romsdal, Municipality of Herøy. The site belongs to the Runde environmental centre (www.rundecentre.no) and is now (2017) occupied by a new WEC developer. The devices and switchgear were deployed in September 2009. However the machines have not been operational due to technical problems with the takeoff/surface buoy and the project has been put on hold. The permit was issued in December 2008. The permit application was delivered to the Norwegian authorities, (Norwegian Electricity Authority “Norges Vassdrags- og Energidirektorat” NVE) in May 2008 and a consultation process was undertaken. Seven months after, in December 2008, the consent was given by NVE. The operational permit was valid for five years, i.e. until January, 2014. It should be noted that the permit application and environmental risk evaluation is a fairly short document, and that no permit was given in accordance to the EIA-directive, but only to national legislations. The existing legislation, in combination with the limited lifetime and extent of the project, did not entail the need for an extensive EIA and baseline surveys before the permit was given. The permit states a number of conditions with regard to the environment. i) a plan for the environmental monitoring is to be delivered to NVE before deployment of the devices and monitoring results are to be delivered to NVE at the end of the project; ii) if items of archaeological interest are discovered, all installation work must immediately be stopped and the Bergen Maritime Museum must be informed; iii) marking of the buoys must be undertaken according to guidelines and legislation; iv) an agreement must be made with the local kelp trawlers that no trawling will be undertaken in the cable area during the test period. The general expectation on the project was that it would have little or no impact on the ecological communities in the area. This expectation is related to the small project scale (both spatial and temporal). Still the authorities required environmental monitoring to be undertaken within the area, in order to investigate the presence/absence of impact on the environment. A monitoring programme was therefore designed during 2008 and 2009. A second purpose of the monitoring was also for Vattenfall to gain experiences about the design and management of an environmental monitoring programme and test a variety of monitoring methodologies and equipment. These experiences were to be used for Vattenfall’s future larger scale wave power projects. The overall project management for the environmental monitoring was carried out by Vattenfall AB, but the scientific advising and execution of the programme was the responsibility of researchers at Runde Environmental Centre. In addition, external scientific review is providing by researchers at Vattenfall AB, the University of Uppsala and the Norwegian Institute for Nature Research (NINA). The environmental monitoring at the test site focuses on three groups of ecological communities that, both by scientific experts involved in the process and by the Norwegian authorities involved in the consent process, were deemed the most likely to respond to an installation that size at the particular location: fish, benthos (bottom-dwelling flora and fauna) and birds. As far as possible and practical, the general monitoring strategy follows a so-called BACI (Before-After, Control-Impact) design with control-impact comparisons modified to a gradient analysis in a number of cases. Hence, studies were to be performed before, and after the deployment and during operation of the wave energy system, i.e. over a period of approximately three years, given a two-year test period. However, due to the fact that the project was put on hold the environmental monitoring programme was never carried out according to the plans. Initial investigations were performed for fish abundance and benthic communities during the first year, but when the technical parts of the project were put on hold so were the environmental. Seabased at the Maren Site is located in Norway. Video analysis through a Remotely Operating Vehicle and grab sampling. The seabed at the test site is flat (<5% inclination) and the substratum consists of small pebbles and rocks (up to 10 cm diameter), interspersed with sandy areas characterized by sand ripples, i.e. wave action from the surface is evident. Identify the wave climate in the area. Desk based survey, comparison with nearby oceanographical station, field survey with measurement buoy. The wave resource at the test site location was identified and analysed. Determine the bathymetry patterns and the sub bottom profile in order to identify a flat and stable area for the deployment of the machines and the cable. Data acquired using vessel mounted Multibeam Echo sounder and vessel mounted sub-bottom profiler and RTK-GPS system, over the potential area for the test site and along a number of potential cable corridors. The bathymetry contours are relatively parallel to land. A flat area of water depths of approximately 50 m is found at 400 m distance from the shore. The survey area is mainly covered with sediments like sand and gravel. There is also a part of the area with bedrock in the East part of the survey area. There are some sub bottom layers visible, which could be made of sand. The cable routes have seabed conditions of mud/soft material with several parts of rock and stone. The flora is dominated by rock encrusting coralline red algae, lacking upright vegetation. Sessile species, especially calcareous tube-constructing polychaetes. On sandy patches, hydroid colonies (single stalks 10-15cm high) provide evidence for a high-current environment. Overall, the benthos is species poor with regard to sedentary species, and only very few mobile benthic species were recorded. (February-April), during which time these species are also fished commercially. In contrast, mackerel frequents the area during fall and is fished at that time. Describe seabird abundance and distribution. Desk based survey to identify present bird species, their feeding and breading behavior. Runde is well known for housing the most southerly seabird colonies in Norway. With approximately 180,000 breeding pairs annually, these colonies are among the largest in Norway. For a variety of reasons, Runde has received international status as an ‘Important Bird Area’ (IBA) by BirdLife International. Breeding seabirds are concentrated along the western steep cliffs of the island, with individual species grouped into separate colonies in distinct vertical and horizontal locations. The densest aggregations of nests are found alongside the south-western cliffs of Runde, i.e. approximately 1 km of Måganeset, the Maren test site. Breeding seabirds are feeding on a variety of fish and other marine species. Desk based survey on navigational charts and OLEX-data from vessels, identifying the distribution and abundance of navigational traffic as well as navigational aids. Boat traffic is passing the area, and a number of navigational aids are located close to the site (but avoided during the site identification exercise) but at the site itself, there is very little boat traffic. The main shipping lane passes a number of hundred meters further south of the test site area. Desk based study, interview with fishermen and authorities. Near shore, small scale fishing takes place at many locations around Runde island. However, at the chosen location for the test site the fishing activity is fairly limited. Identify areas where kelp trawling takes place. Desktop study, interview with trawling industry and authorities. Like the entire region, kelp is trawled around Runde island as well. The trawled waters are found at depths at 2-20m. As the test site itself is situated at 45 m, this is not a conflicting interest for the site itself; however it could be for the cable. Therefore the choice of cable transect was made in discussion with kelp trawlers and avoided the conflicting water depths as much as possible. Andersen, K., Chapman, A., Hareide, N. R., Folkestad, A. O., Sparrevik, E., Langhamer, O., 2009. Proceedings of the 8th European Wave and Tidal Energy Conference (EWTEC 2009), Uppsala, Sweden. Assessment of the changes to the surrounding benthic species community (species abundance and composition of macroflora and fauna). To assess the effect of the structures on colonization with marine species on the structures themselves. Quantitative assessment of macrobenthos (flora and fauna) by video transects, in four different directions, within a 30 m radius around the installations and control areas nearby following a BACI design. Quantitative visual assessment of benthic communities (abundance and composition) on the component of each WEC. Still photos of 0.25 m2 by ROV-mounted camera on different structure components. The sampling design is stratified randomly with 3(4) samples taken per structure component of each device (i.e. foundation horizontal, foundation vertical, cylinder, buoy) as well as on the switchgear. No differences in substratum type or benthic community composition and structure among the four investigated circular 30m-radius areas surrounding WEC and Control locations. The only post installation survey that was undertaken was made after approximately 6 weeks of submersion. It is important to note that this was only made qualitatively (other than planned). At that time colonization of the structures was very limited, i.e. only few and small bryozoans and hydroid colonies were recorded. To investigate whether there is a measurable effect of the installation on fish abundance, distribution (vertical and horizontal) and behavior (aggregation, vertical migration, etc). Fish abundance and species composition is measured using hydro-acoustic methods, i.e. hull-mounted echo sounder (Simrad EK 60) on a vessel, and results are shown as density maps separated by depths zones. The hydro-acoustic methods are combined with fishing trials for species identification. Additional observations from benthic ROV studies (e.g. on fish species and fish behavior) complement the quantitative fish abundance data with incidental information, such as fish feeding on benthic organisms colonizing the Maren devices or fish seeking shelter under the buoys. Sampling takes place to assess diurnal variation (day vs. night) as well as seasonal variation (four sampling events per year during spring, summer, autumn, winter). The monitoring follows a gradient design or by using control areas. At the first field survey algae bloom occurred and nearly no fish were present. At the second time the main fish species present was mackerel. According to ANOVA analysis there were no indications that there were natural variations between the investigated area and the control area. The most important experiences during 2009 investigations are related to methodological issues, including echo sounding software and data processing and analysis. With regard to echo integration techniques, the particular situation of the MAREN environmental program is unusual in that the investigation scale is small compared to most other studies using this technique. Therefore, a number of adjustments in data extraction, processing and analysis, as well as interpretation are required. It was experienced throughout the project that the methodology (even adjusted) was still not satisfying. The small spatial scale of the project and the potential impacts could not be assessed in a way that provided high enough resolution of the results. Describe seabird abundance, distribution (e.g. aggregation on or around buoys) and behavior (e.g. resting, feeding). Scan the area by telescope from an elevated point on land at Måganeset (~400 m away from the test area). Birds will be identified to species level and numbers recorded in relation to a triangular grid identifying sections of increasing distance from the Maren structures at the center. A gradient approach is hence taken for the investigation of potential changes. Their behavior will also be assessed. The grid is to be marked with floats (diameter: ~0,4m) in order to help identifying the boundaries of the grid. This investigation was never undertaken, only planned for. The main reason for this was that it was identified that a separate permission for the installation of the marking buoys was needed from the Norwegian Coastal Administration (NCA) , which delayed the activities. The permission application was delivered in June 2009 and the consent approved in September 2009. This was after the deployment, meaning that no “before-investigation” could be undertaken. Then, the technical problems of the installation meant that the whole EMP was put on hold and the bird monitoring never started. Underwater noise generated by wave energy device. Presence and propagation of underwater noise from the Seabed wave energy device and transformer is to be monitored and the potential effect on the marine life in the area analyzed (in the first stage based upon the information on the noise characteristics as well as the audiograms of fish and mammals). The exact methodology and design is to be defined during the second year of the project. No noise investigations have been carried out and the detailed planning of the measurement have not been undertaken, as the project was put on hold. Internal R&D projects within Vattenfall (regarding methodologies, field surveying etc).